WIP — Wigs in Process. These are Tibetan lamb wigs and you can see the fleece for the braids on the left. It hasn’t been combed yet. Combing fleece… That’s a chore! 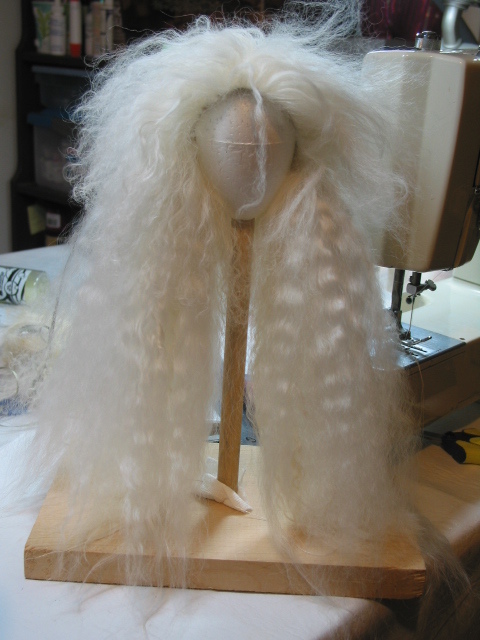 I’ll be giving a short presentation on making doll wigs this weekend. To get inspired, I’ve been making wigs for a few weeks. I just got them photographed and thought that some before and after shots would be fun. 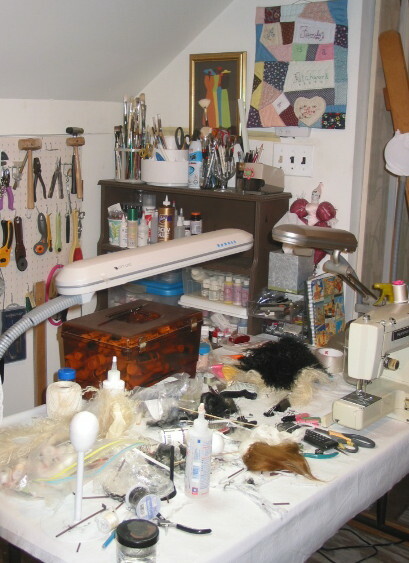 My messy worktable covered with fleece and stuff… When this table got too full, I moved to another table and completely cluttered it too. You can see more of the new wigs on my “Wigs” page. I’ll have a few for sale on Etsy or eBay as soon as I can get them written up. 21 Mar	This entry was published on March 21, 2013 at 4:26 pm. It’s filed under Doll Making, Doll Wigs and tagged ABJD, BJD, Dolls, Wigs. Bookmark the permalink. Follow any comments here with the RSS feed for this post. I’m a santa maker and would love to try this tibetan fleece. I can’t find it anywhere. Do you mind giving a hint as to where I might find raw fleece? I’ve found it at shows and I’ve bought surplus from other crafters… I’d love to find some additional reliable retailers. My most recent lamb purchases were from Joggles.com. The quality was very nice. Their color selection is limited but the white can be dyed. White is probably just what you need for Santas and the white I got from Joggles was lovely. Can we see your Santas on-line anywhere?